B.A.S.S. Elite Series rookie Ott DeFoe is looking forward to fishing near home for the 2011 Bassmaster Southern Open at Douglas Lake. Photo Credit: B.A.S.S. The thing that Bassmaster Elite Series rookie Ott DeFoe is looking forward to most about the Douglas Lake Southern Open isn’t the potential for 25-plus-pound stringers, and it isn’t for the chance to earn a berth in the 2012 Bassmaster Classic. It’s the fact that he gets to sleep in his own bed. For DeFoe, 25, one of the hardest parts of being a touring pro is time spent away from home and growing family. When he leaves his Knoxville, Tenn., home, he leaves a young daughter and his wife, Jennie, who is pregnant with the couple’s second and third child, twins due the 15th of June. Douglas Lake, along with Jefferson County, Tenn., play host to the third 2011 Bass Pro Shops Bassmaster Southern Open June 2-4. DeFoe has partnered with Jefferson County for both the 2011 Elite Series as well as this Open, and is thrilled to see such an event on his home lake. Fish catching and family time aside, DeFoe — along with the whole field — is gunning for a win, which guarantees a nice cash prize as well as an automatic berth in the 2012 Bassmaster Classic, set to be held in Shreveport, La., next February. Though DeFoe is having a phenomenal Elite Series debut and will likely be a Classic contestant, he’d like to have the Classic locked down so he can put his mind at ease for the final two Elite events. Douglas Lake matches several other aging reservoirs in the Volunteer State: It’s relatively deep, clear and lacks much in the way of cover. However, whatever it lacks in fish-holding cover, it makes up for with hefty stringers. DeFoe says that anglers would he wise to focus their efforts on deep-dwelling bass as the fish are postspawn and looking to recuperate from the rigors of the spawn. To do well, DeFoe expects an angler needs 15 pounds per day or more. He believes a safe estimate is that 18 a day will win, making a three-day total roughly 54 pounds. However, DeFoe wouldn’t be surprised if Douglas produces several 20-plus-pound strings. DeFoe went on to say that the heaviest stringers have flirted with the 30-pound mark, reminiscent of the first 2011 Bass Pro Shops Bassmaster Southern Open this season, on Florida’s Lake Toho, where DeFoe caught 61-7 over three days and came in fourth. However, DeFoe says one of the best parts about Douglas Lake is that most every angler — both pro and co-angler — will catch a limit. 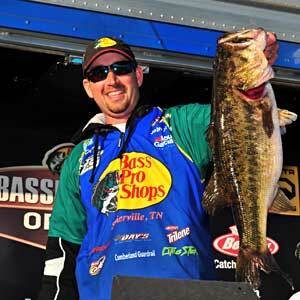 The limit for pro anglers is five bass, while co-anglers are allowed to bring in three bass. The boats will launch daily at 6 a.m. ET from The Point Marina, 122 Boat Dock Drive, Dandridge, TN 37725. Weigh-ins will take place June 2-3 at 2 p.m. ET at the launch location. The final weigh-in, Saturday, June 4, moves to 3 p.m. ET at Bass Pro Shops, 3629 Outdoor Sportsmans Place, Kodak, TN 37764; 865-932-5600. All events are free and open to the public. Weigh-ins are streamed live on Bassmaster.com, so fans everywhere can watch the weigh-ins free with an Internet connection. For more information about the Bass Pro Shops Bassmaster Southern Open on Douglas Lake, go to www.bassmaster.com/open.